Shane's pancakes this weekend were spectacular. 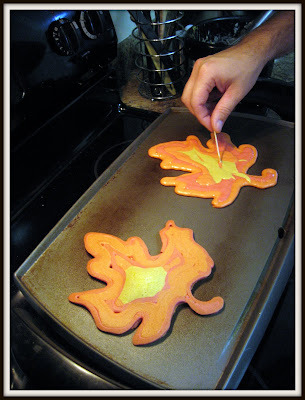 Seriously, he is a pancake artist. Lydia and I went out and picked leaves and Shane based his pancake shapes on Lydia's favorite one. After making the pancake batter, Shane separated it in thirds. He used red food coloring to dye one batch red, one batch yellow and combined red and yellow food coloring to make the third batch orange. The colors were a bit vibrant, so he added chocolate syrup to dull them. 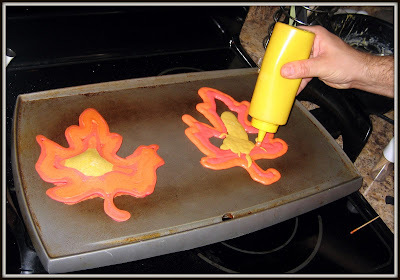 He added each batch to a condiment dispenser and drew the leaves directly on the skillet. Shane used a toothpick to draw the leaf veins. Flip, add a bit of maple syrup and you are good to go. I totally made some about a month ago because of how u explained before. everyone Looooooooved them!!! such a cool idea & different colors are a way cool idea! You were right too they are really not difficult either. I have been searching for those bottles ever since you gave us the idea! I keep telling my husband about it, as he makes pancakes for our girls every weekend anyway! (He thinks it is a great idea.) I have no clue why I can't find them anywhere. The leaves are so cute! Okay, I tried these last weekend. I think I need to make the batter thinner and make sure it has NO lumps whatsoever. Sigh. Shane must be a master because mine were a little amateur. But I will try again! Has he ever tried a piping bag? Those are amazing! I will have to do them here! Uhh.. Can I borrow Shane? He can teach Dave.. hehe..
Natalie- I ablsolutely love the last like 20 posts on your blog. The creativity and coziness of your fall activities, etc. makes me want to jump through my computer straight to your house to enjoy all the fun your creating up!You're amazing. I love Shane's pancakes- so fun! And I LOVE Colin- Joey was a BIG healthy baby like that and I loved it- especially after my tiny preemie Connor- I didn't know what to do with all Joey's rolls except kiss him all the time! I wish we lived closer! miss you! Oh! My son would love these!!! Great Sunday breakfast idea!!! 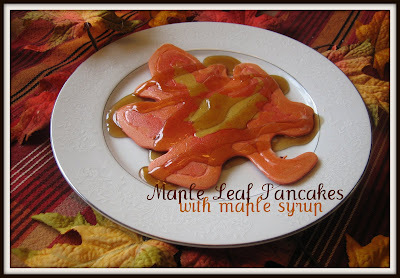 maple leaf pancakes with maple syrup!!! Wow! LOVE these; we will be trying these in our home very soon. Thanks for sharing the idea AND the photos! Next time he stays with us, he is FOR SURE making us pancakes. SO incredible! How clever! They look wonderful.